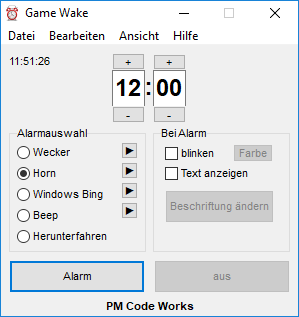 Once the alarm has been set, clicking on the "Close" button will not terminate Game Wake, but minimize it to the tray icon area. This feature has been incorporated to prevent accidental termination while the alarm is still set. If you want to terminate Game Wake anyway, simply right-click on the tray icon and select "Exit". Game Wake stores its settings in an INI based configuration file. The menu item "Options" can be used to select what should be saved. Multiple languages are supported. Game Wake is available for Debian and Windows. Game Wake is primary distributed as setup. In addition to the setup, Game Wake can also be downloaded as a portable version (without installation). Game Wake has been digitally signed. To verify the signature the certificate of PM Code Works must be installed.